Brevetti Waf, a company that has produced and exported technology and design products for the beverage industry for more than forty years, launches an all new, modern, and immediate website. 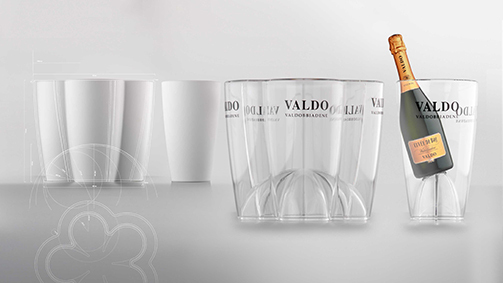 The shape of the new Valdo ice bucket, made of transparent methacrylate, draws its inspiration from the particularly sleek silhouette of a champagne flute; this choice led to the evocative design of the ice bucket, an amplification of the classic sparkling wine glass. The floor of the bucket is characterised by an especially pronounced ‘picure’, the proportions of which mean the bottle remains raised, allowing it to protrude and stand out of the crowded ‘landscape’ of the table. The shape of the ice bowl is an elegant expansion of the ice bucket; the final product was designed by fusing the capacity of 5 ice buckets on a pentagonal platform; it uses the golden section, the natural ratio of proportion that dictates the growth of every animal, vegetable and mineral being, evident also in the leaf of the grape vine. This approach has produced an ice bowl with a compelling visual impact and the capacity to chill 6 bottles of Valdo sparkling wine: one in the centre and five in the surrounding niches. The bottom of the bowl also raises and affords prominence to the bottles.